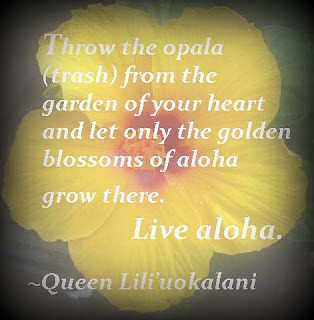 “Throw the opala (trash) from the garden of your heart and let only the golden blossoms of aloha grow there. 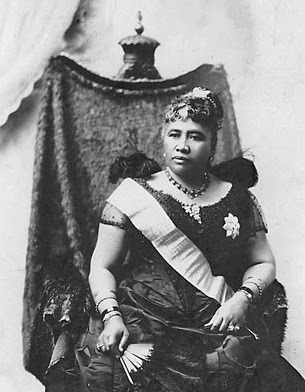 Live aloha.” Queen Lili'uokalani, several years after the overthrow of her kingdom and annexation of Hawaii in 1893. Born into a life of privilege, Queen Lili'uokalani endured hardships: a troubled marriage, the takeover of her country, the death of her kin next in line to the throne, and imprisonment in a room in her own palace. Despite her suffering, she wrote songs, including the famous Aloha O’e (Farewell to Thee); translated the kumulipo, the Hawaiian creation myth; and wrote the first book by a native Hawaiian woman: Hawaii's Story by Hawaii's Queen. I would not consider her a stereotypical or cliché symbol of Hawaiian culture. She was far more than that. Perhaps of all the people in Hawaiian culture and history, she was the greatest torchbearer for the spirit of aloha. Without her, I’m not sure that the Hawaiian concept of aloha would carry such weight. She lobbied many times to regain her country and was still able to forgive. If Kamehameha the Great was a warlike ruler, then she was the opposite. Her legacy is the spirit of aloha as it’s understood today, as well as the basis for the Hawaiian sovereignty movement which is trying to wrest control of Hawaii back from the United States. What an interesting woman and I think I will look into her book . Aloha O'e is a beautiful song and I remember my mother singing. "One fond embrace, Ere I depart, Until we meet again" The music certainly transcends generations. Even the word 'aloha' is soft, rhythmic, fluid, gentle. How lovely to have this brave soul as your ancestor, Queen Lili'uokalani. Thank you for this informative post. Please read the post at Blogging from A to Z today (Friday April 19). I've featured your blog to help you gain some new blog followers. Don't forget to visit those who are your new followers and have left comments so you can thank them and reciprocally follow their blogs. We're trying to accomplish some fruitful networking today! I first found out that we annexed Hawaii by watching Obama's America 2016 and was very surprised by that fact. The Hawaiian culture is so great--I have a lot of friends from there or went to college there. Excellent Q subject! The spirit of aloha is quite a legacy to leave! I'm happy to discover your blog through the A to Z Challenge and I look forward to reading more! Interesting flowers in your masthead. Didn't realize that Hawaii had a queen and royal family in the past. She certainly had a tough life. Poor lady. This may be your best post so far. She was a remarkable person I didn't know about until your article. She is a great role model and someone I now admire. Thanks! What a beautiful quotation, and how much more powerful it becomes knowing the backstory. To retain the power of forgiveness in spite of the challenges and hardships she faced--now that's a hero. I'm new to your blog, and I'll be back. Thanks Kern. I'm going to try to find your blog - which perhaps is listed somewhere in disqus land or in my email or google. She was quite a woman. Thanks Kimberly (and everyone else who commented earlier). I'm slowly going through the list. : ) This was one of my shortest posts, but perhaps, easiest to digest. Aloha Shawn, what an interesting way to find out that Hawaii was annexed. It's still a thorny issue here. Mahalo for stopping by.